Tragedy struck, yesterday, when a container fell off a truck and killed a woman. The truck, carrying the number plate, BDG 808YF, coming from Tin-Can Island, was entering the service lane at Berger Yard Bus Stop on Apapa-Oshodi Expressway when the driver lost control. Meanwhile a commercial bus driving against the traffic (one-way) was approaching. The truck hit the median and the container fell on the bus. An eye witness told Sunday Vanguard: “The bus took one-way while the truck was coming from Tin-Can Island. The truck lost control, hit the culvert. Immediately the bus driver saw that, he wanted to avoid it. The passengers ran out, some fell into the drain. It was only a woman that died in the rush. It happened that while she was rushing out, the container fell on her and cut her into two. Immediately it happened, the truck driver took to his heels.” Four people in the bus were said to have sustained minor injuries. 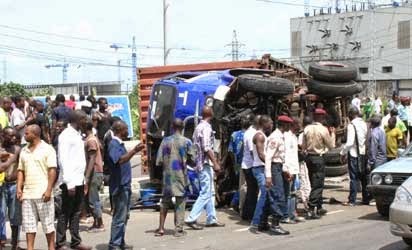 They were taken to hospital immediately by the personnel of Federal Road Safety Commission,FRSC, who mobilised to the scene, even as the truck has been impounded by the commission.